One of the most interesting things in 3D computer graphics is the constant need to test different ways of doing the same work. Generally seeking a more practical and faster alternative without losing quality compared to traditional techniques. In the field of forensic facial reconstruction for example, despite to have already a good range of methodologies linked to digital modeling, it never hurts to propose new approaches, especially if they offer faster and more accurately with respect to human anatomy. 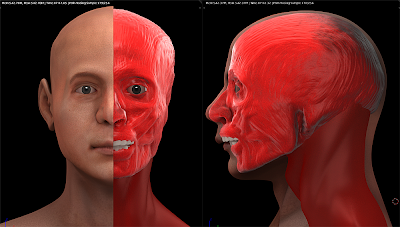 As mentioned earlier, in order to make the process more convenient, intuitive and less tiring forensic facial reconstruction, we decided to change a bit the way of modeling the muscles and the base of the skin. Originally, to model the facial muscles, I used a pre-modeled structure by editing their volumes and subsequently sculpting additional details. Despite having a quick execution, this method is not very intuitive and much less elegant. I figured it would be much more practical now sculpt the structure of the major muscles on the skull. The big question was: How to do this using the structure of the skull? 1) I only had to involve the skull with another object, such as a sphere, using the Shrinkwrap modifier in Blender. This object needs to be slightly smaller than the skull, evidencing which areas should be filled with muscles. 2) This geometry created is difficult to edit, because the lack of uniformity in its structure. To resolve this impasse we use the Remesh modifier that creates a mesh with 4-sided faces, more or less the same size, ideal to be carved. 3) Once set the base, I just sculpt your core muscles, creating new subdivisions if necessary. When using the Blender sculpting tools, the appearance of the muscles is naturally fibrous, in order to take a more compatible with real tissue structure. If this is not the ideal result, at least this is much higher than that of the previous methodology. 4) Once muscles are ready, simply create a copy, simplify it with Remesh and sculpt the base of the skin that will be the benchmark of adequacy of face modeled before. 5) Using the Shrinkwrap, we suitable the mesh to match it with the muscles and the tissue depth markers. 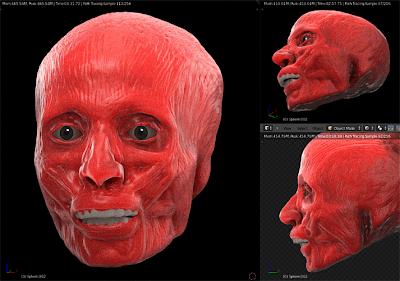 The purpose of this methodology among other things is to harness the expertise of some professionals with classical modeling, making the process simpler and offering the possibility of division of labor, where a person sets up the skulls with markers, another person riding muscles and skin base and finally the artist creates the final rendered face. Last but not least, the modeling in Blender sculpt mode making a phase that would be boring in one of the nicest and most fun parts of forensic facial reconstruction, such is its convenience and intuitiveness. The development of the methodology proceeds, any news will be posted here. For The Field Museum in Chicago that shared a video with a CT-Scan that was reconstructed in this post.